Whether you're looking for unmissable museums and ancient sites, alluring nearby islands, night-time hot-spots, shopping streets, liveliest festivals or want to find the best restaurants and tavernas in Athens; this guide is the perfect pocket-sized companion. Rely on dozens of Top 10 lists for all budgets - from the Top 10 Greek dishes and archaeological sites to the Top 10 city strolls and itineraries, shops, hotels and, to save you time and money, there's even a list of the Top 10 things to avoid. DK Eyewitness Top 10 Athens is packed with beautiful illustrations of this historical city, providing the insider knowledge every visitor needs to know. Explore every corner effortlessly using the FREE pull-out map, plus many smaller maps included within the guide. Your guide to the Top 10 best of everything in Athens. 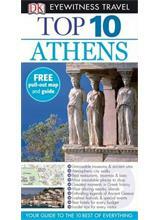 Request: DK Eyewitness Top 10 Travel Guide: Athens.